A liberal arts education should not mandate distributive requirements. Little in life frustrates me — an ever-proud humanities major — more than the science, technology, engineering and mathematics fields. It’s hard to place exactly why that is, but I learned early on in life that the path of the scientist was hardly one that I wanted to follow. Sure, I played the game in high school: I padded my college applications with a myriad of AP and Honors STEM courses in the hopes of coming across as more accomplished and well-rounded to college admissions committees. But being able to succeed in a field and actually enjoying the subject matter are vastly different ideas. It’s safe to say that post-high school, I was elated to be finished with what I considered to be naught but tedious means to an end. However, college is not the escape from STEM that I had always dreamed it would be. Instead, Dartmouth mandates that all students take a variety of courses, from STEM to English to art, in order to graduate, which is to a certain extent infuriating. Don’t get me wrong: I knew what I was getting into when I decided to attend a liberal arts college, as my college-bound friends and family had regaled me since I was young with tales of the suffering that accompanies “gen-ed”courses — called distributive requirements at Dartmouth. Yet this shouldn’t disqualify me from criticizing the system. While I understand the aim of a well-rounded education, I question the utility of requiring such a breadth of coursework to graduate. That is, students might gain less from dividing their attention between disciplines out of necessity than they would from pursuing those that pertain to their interests and aspirations. Take, for example, the hypothetical case of an English major — I’ll call him Billy McEnglish — who aspires to become a journalist for the New York Times. His career will be near exclusively defined by the way in which he is able to write effectively, write quickly and manage deadlines. To that end, Billy’s best course of action would be to craft a curriculum which is predominantly writing-based — be it analytical, narrative or otherwise — that catalyzes and reinforces the development of the three capabilities I mentioned previously. The specific coursework is largely irrelevant, so long as it pursues the end goal of becoming a better writer, and Billy can very easily use his interests as the conduit for this development. “But what does this have to do with distributives?” one might ask. 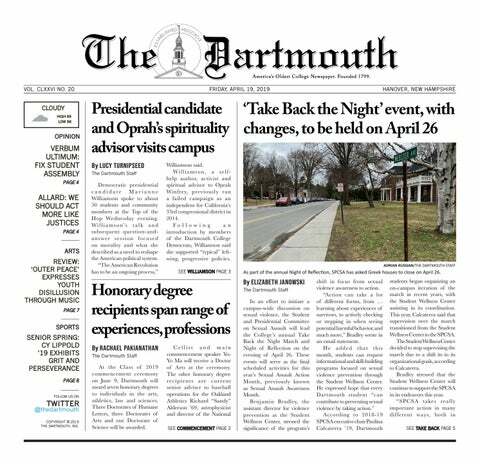 Dartmouth’s liberal arts education operates under the assumption that “graduates must be prepared to deal with complexity, diversity, and change,” according to a 2016 letter from College President Phil Hanlon. and that mandating a well-rounded curriculum facilitates this intellectual development. And while I agree that certain facets of this approach possess their own merit, particularly the writing program, it operates under the erroneous assumption that students wouldn’t explore the variety of Dartmouth’s curriculum without this being required of them. As a member of the Class of 2021, I can attest — albeit only anecdotally — that many students at Dartmouth do not explore courses solely because they are required to, but rather because they want to. Many friends of mine used their freshman falls and winters to test the waters, so to speak, of the different subjects they were considering as potential majors. One friend has changed his corse of study four times already. This was not the result of a liberal arts directive, but of an effort to maximize his education, try new things and enjoy his college experience. For herein lies the flaw of mandatory coursework: it misconstrues the importance of the liberal arts environment for that of a liberal arts curriculum. A liberal arts environment is replete with variety and possibility; it openly encourages students to broaden their horizons and experiment with different subjects. A liberal arts curriculum mandates that students partake in such varied coursework. From a student’s perspective, the former is the ideal — a situation in which those who need to explore in order to elucidate their path in life are free to do so, while those who have already made their decisions are allowed to immediately and continuously develop and pursue their own interests. Again, a liberal arts environment actively encourages intellectual diversity in coursework, but it does not mandate it in such a way that it inhibits many students’ development as academics within their fields. Let’s return to Billy McEnglish, who already knows that he wants to be a writer. Within a college experience free from mandatory coursework, Billy can add any mix of writing-oriented courses to accompany his English major — from science to government — if they either align with his interests or are seen as fortuitous in his development. He does not, however, have to take any science, math or art courses which he might otherwise view as wasteful or unnecessary to his academic development. More broadly, the absence of mandatory coursework lends itself to a more personalized academic experience. Perhaps I have too much faith in my fellow students, thinking that if given the freedom to choose from a plethora of options, they will dare to explore and better themselves intellectually. Or perhaps it is Dartmouth that has too little faith in its student body, underestimating the ingenuity and curiosity which prompted their acceptances in the first place. Either way, I can’t help but dream of a Dartmouth without distributive requirements — one in which students are neither punished for wanting to explore nor punished for wanting to abstain. Wishful thinking, I suppose.